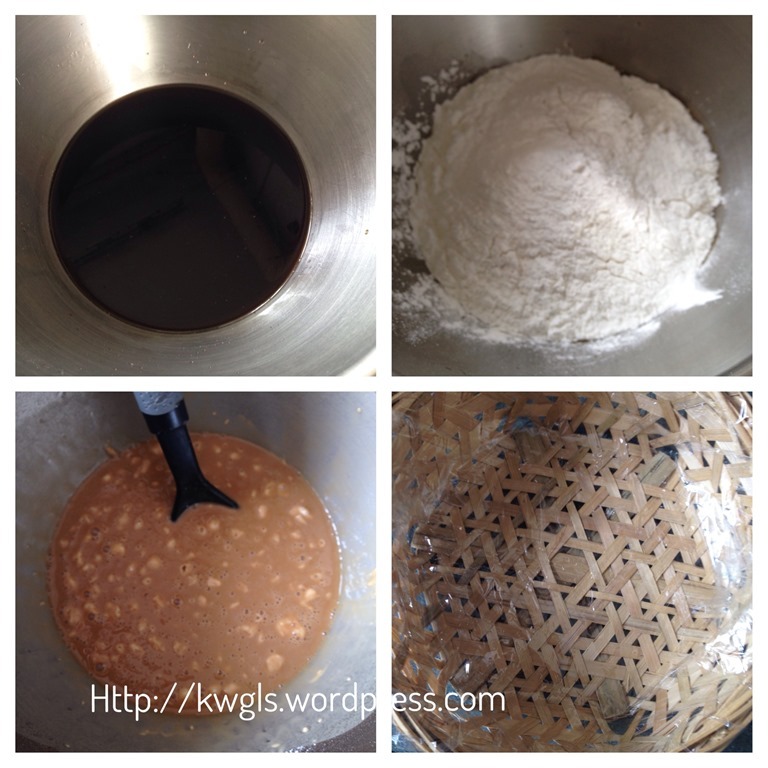 I have been holding this post for a while because I am waiting for my steamed glutinous rice cake to harden so that I can cut and show readers how to prepare this sticky rice cake. Somehow, this is the fourth day, it is still rather soft, I have decided not to wait any more and share with readers the preparation of the cake itself. 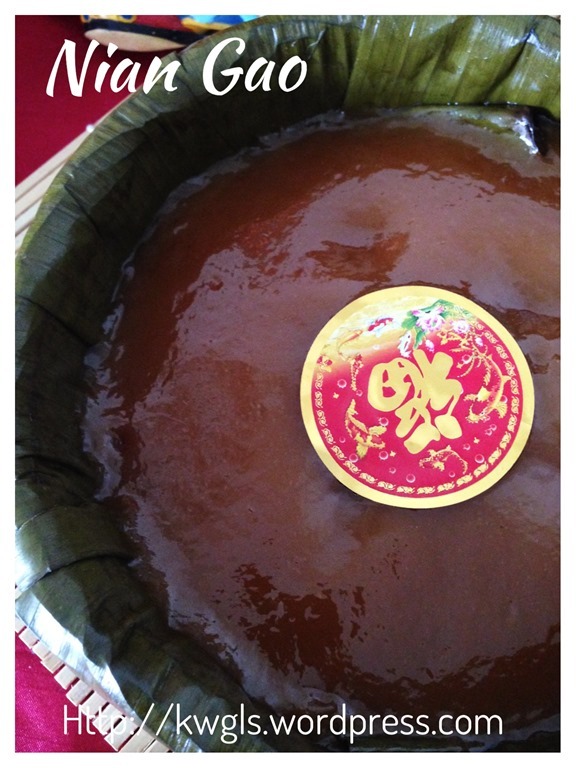 Very frankly, I have a lot to write about this special glutinous rice cake, Nian Gao. 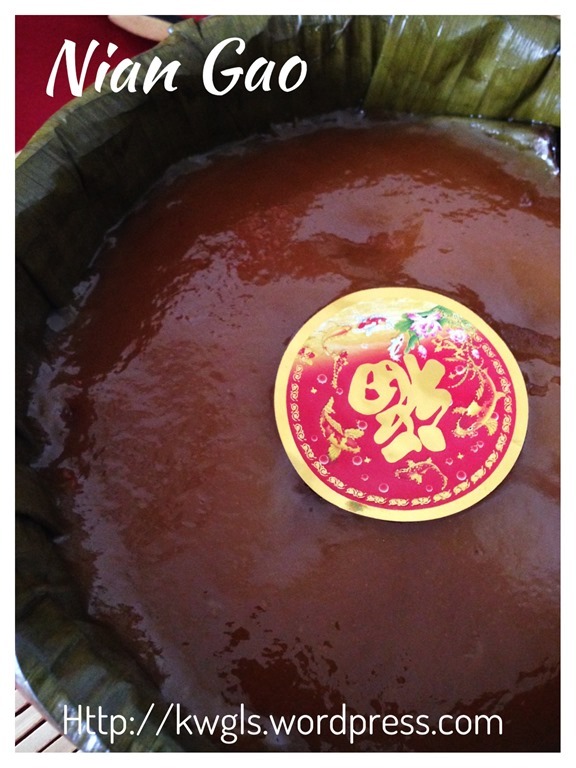 A lot of fond memories and a cake that is a must during the Chinese New Year. This is one of the cakes that was offered to ancestors beside the steamed rice flour cake (huat kueh) and steamed sponge cake (kuey neng ko). As this is Chinese New Year season, I am really running out of time and members in the Facebook Group is waiting for the recipes, therefore, I have to share these recipes as soon as possible before the festival is over. 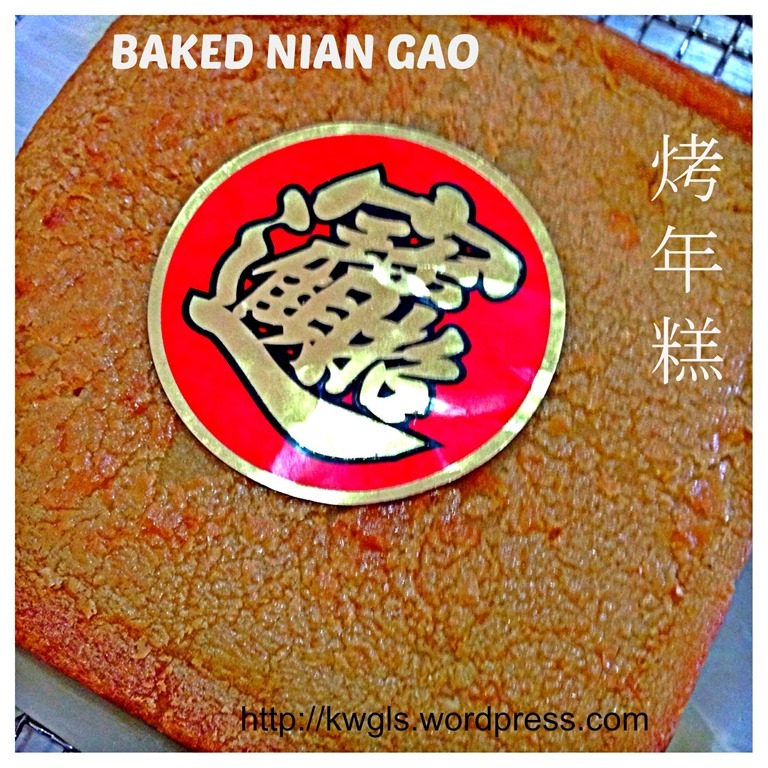 I do not intend to write about what I know about Nian Gao, instead, I will refer readers to Wikipedia that have a very good write up about this cake. 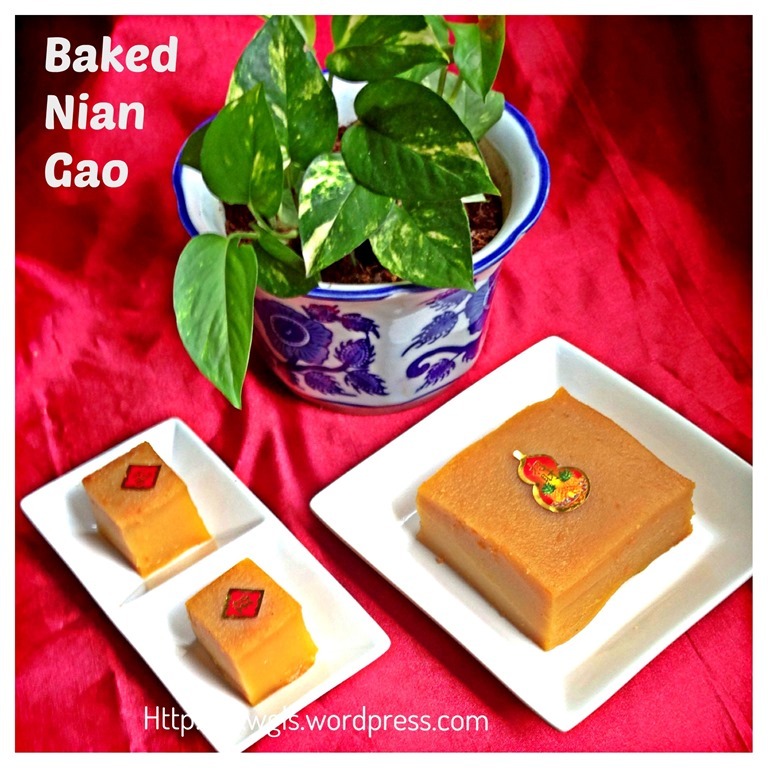 Baked Nian Gao is definitely not common among the Chinese in Singapore and Malaysia. 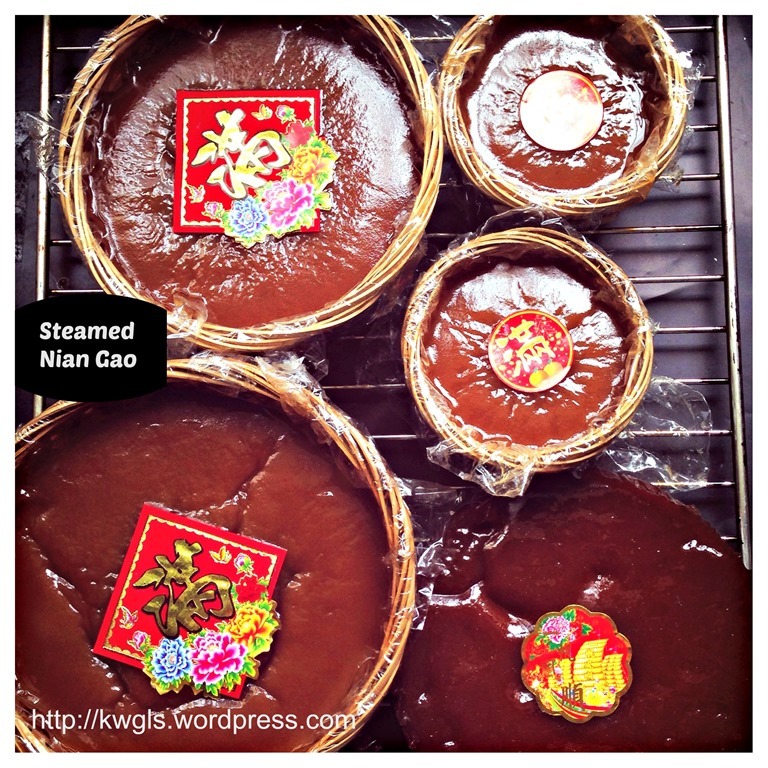 What is common is the steamed Nian Gao. However, it had become popular for overseas’ Chinese. Pardon me if I am wrong, in order to meet the taste buds of non-Chinese, butters, eggs and flavouring (such as almond, coconut etc.) were added and baked in the oven instead of steaming. It is a rather common dessert during Chinese New Year in China Town restaurants. 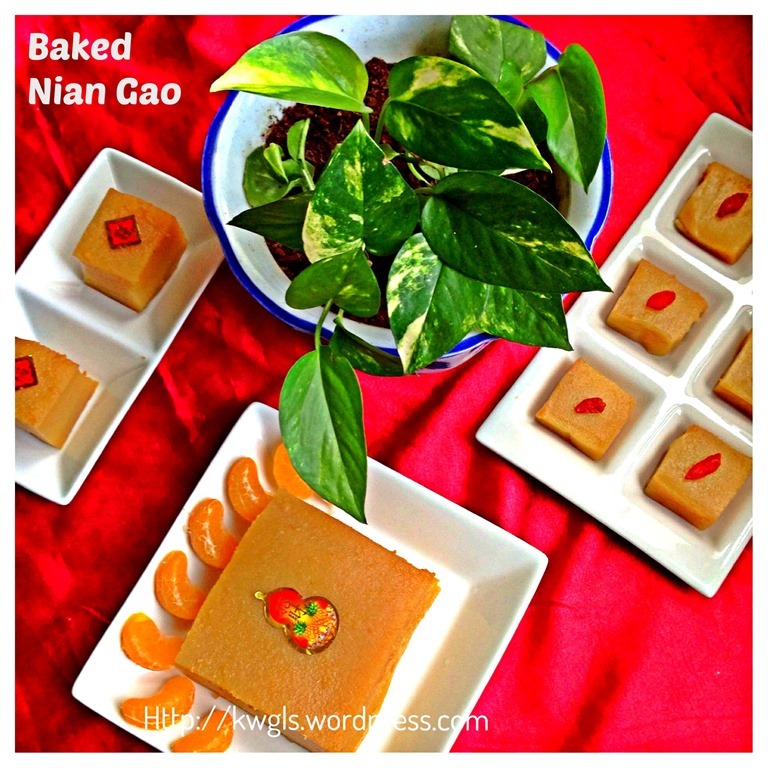 Last year, I baked one Nian Gao and I loved it very much. 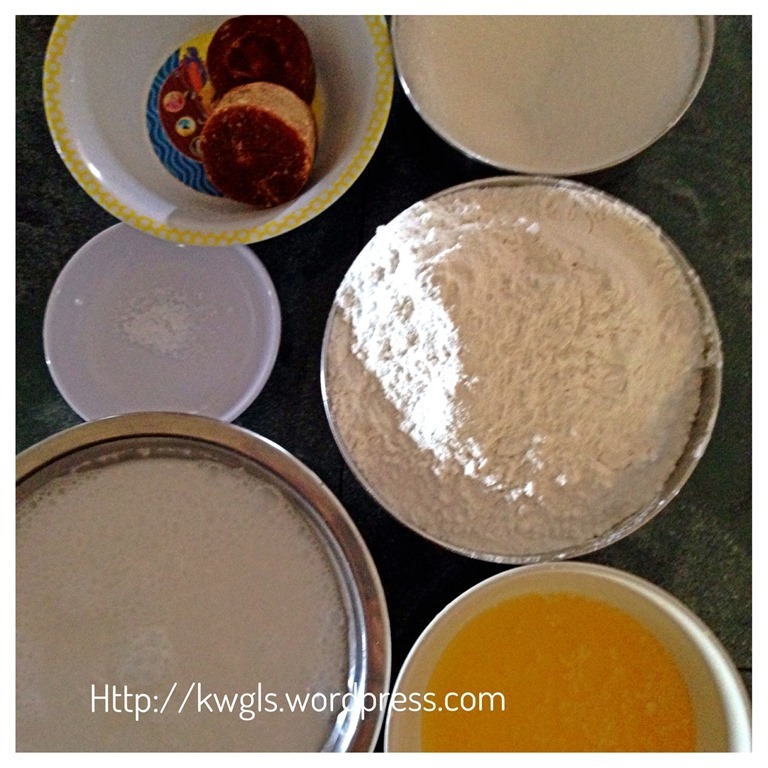 This year, I have decided to bake it again and share with readers. 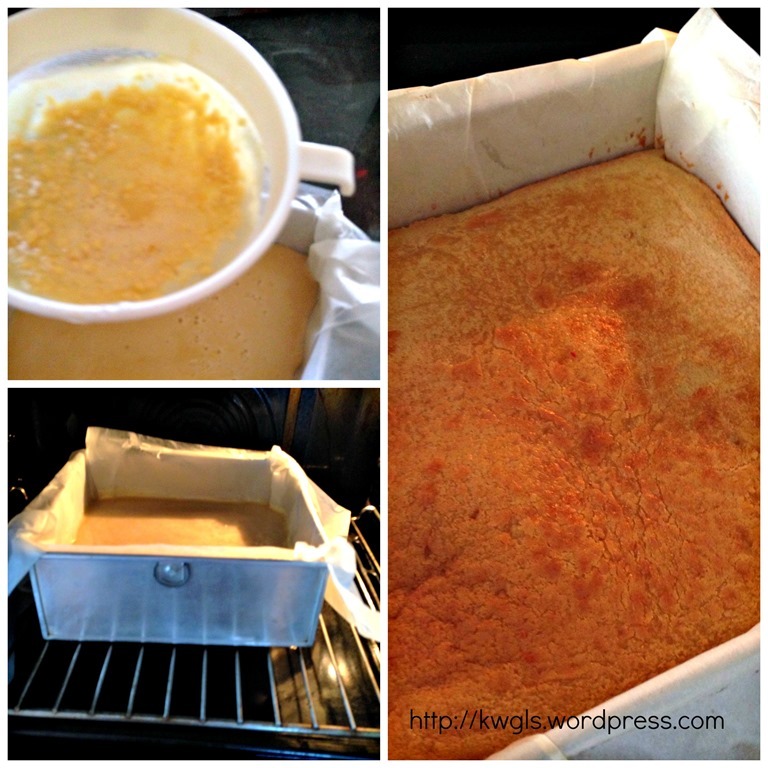 Line a 8” x 8” square tin with parchment paper and pre-heat the oven to 180 degree Celsius. In a sauce pan, heat the gula melaka (coconut sugar), melted butter, coconut milk, salt and water under low to medium heat until all the coconut sugar and sugar have dissolved. 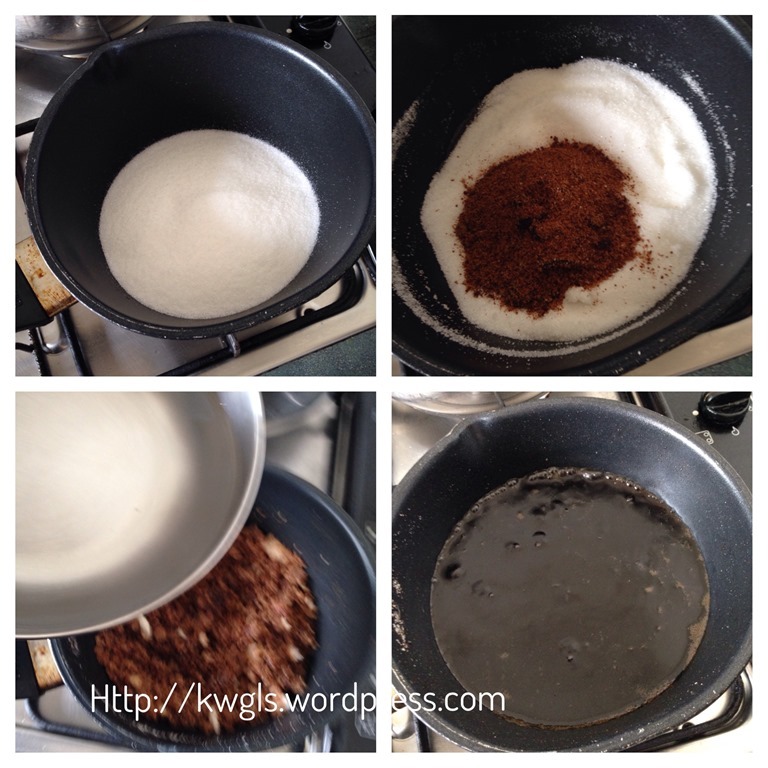 (Note: if you are not using coconut sugar, you can just mix all the liquid ingredients without heating the liquid). Let it cool at room temperature. Transfer the liquid to a big mixing bowl. Add the eggs and mix well. Add the glutinous rice flour, use an egg whisker or spatula to stir until well combine. Sift the flour mixture into the baking tin. Bake in the oven at 180 degree Celsius for 30-45 minutes or until the cake is set. Cool completely for at least one hour before transfer out for cutting into desired size. 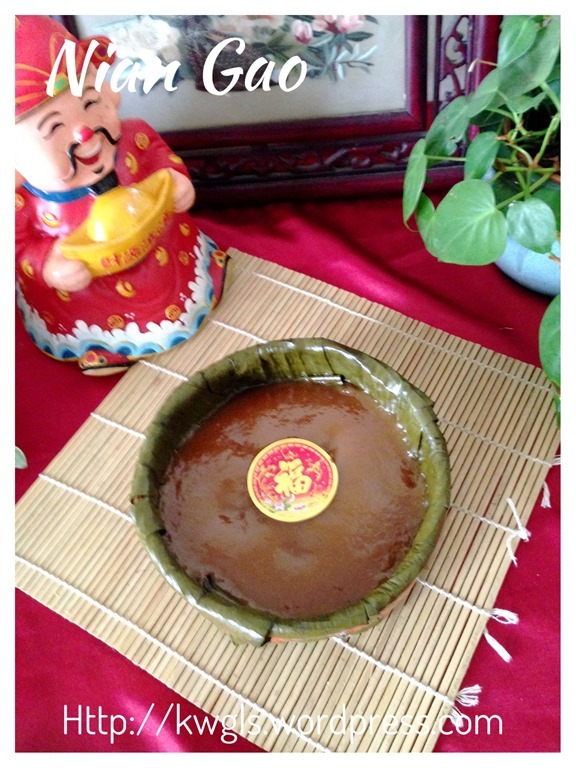 Steamed Nian Gao is the type of Nian Gao that we prepared for offerings. It is vegetarian and I can’t recall in my whole life, I have any year that I did not have a Nian Gao with me if I am at home. 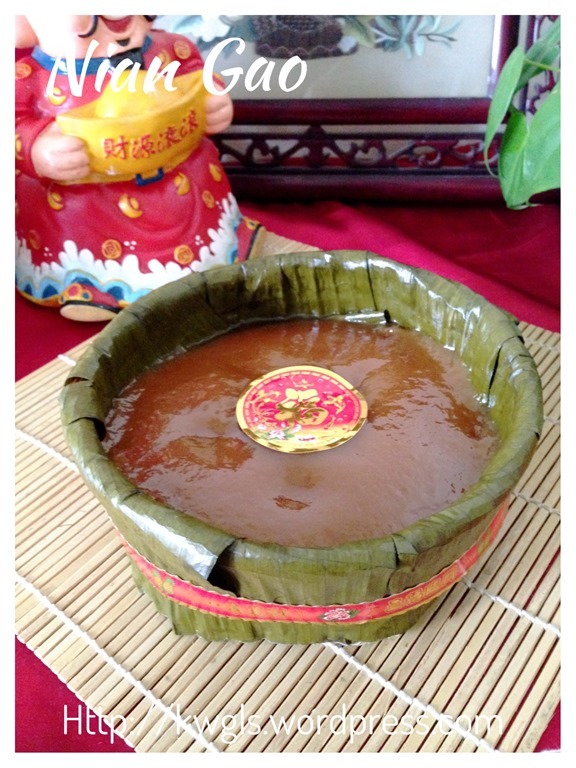 It is supposed to be an auspicious cake and in the olden days, there were many taboos associated with the preparation of Nian Gao. It can be fried with eggs the same way as French toast, re-steamed, or deep fried by sandwiching between sweet potatoes and yams. I only use about 1 hour to steam this cake though most recipes called for a rather long time from 2-10 hours. I honestly believed that this is due to the bamboo basket that I have used to steam the cake. 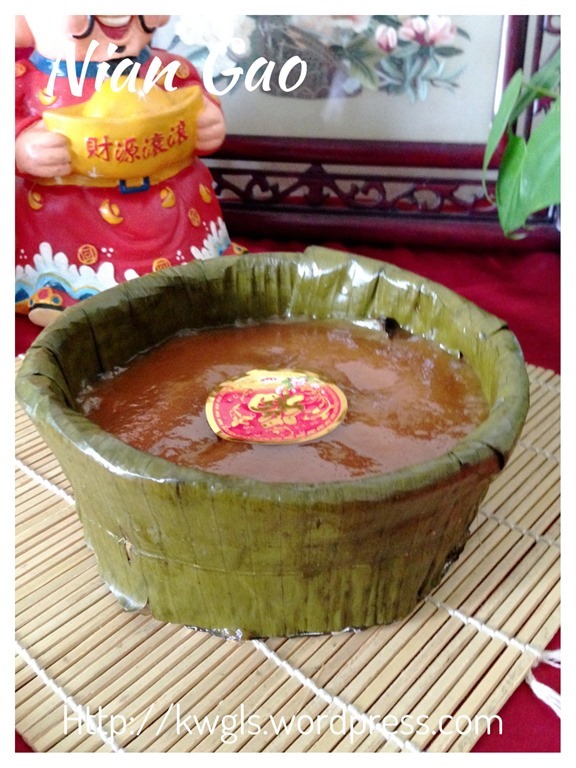 Bamboo basket has many holes and heat can penetrate and cook the cake more easily. 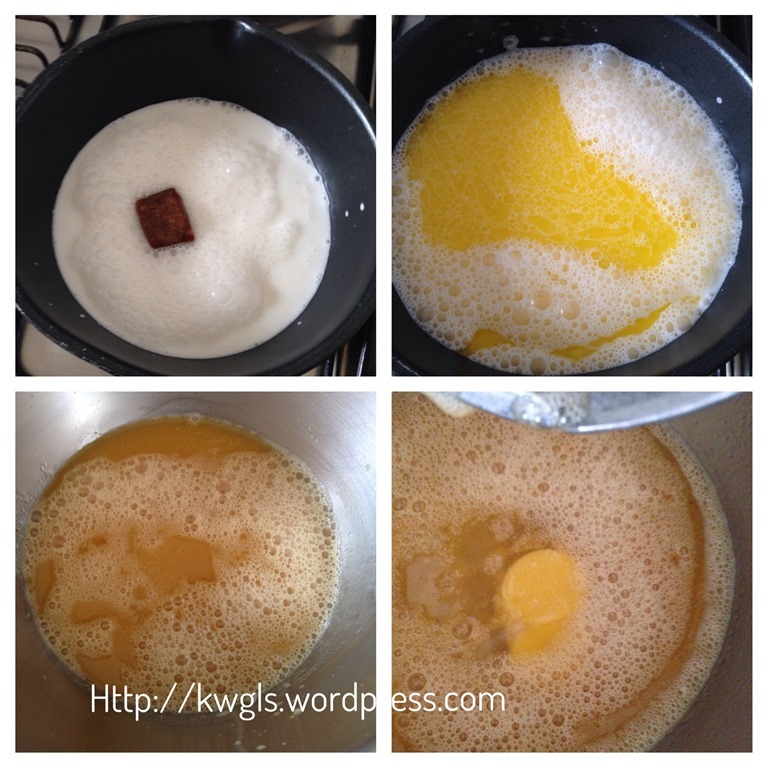 In addition, the brown or black sugar used have the effect of browning the cake. Traditionally, the 10 hours used is waiting for the sugar to caramelize in the steaming process. It is possible if you have the time. I have not tried as I am concerned about my gas bills.. Ha-ha but I have witnessed my auntie who prepared this in a very traditional way using castor sugar and it needs at least 7-8 hours steaming using a very big wok. Get ready a steamer, put water and bring to boil under high heat. Put a cellophane plastic sheet on a 6 inches bamboo basket. You can refer here on how to put the cellophane tape on the bamboo basket. For Singapore readers, both cellophane sheet and bamboo basket can be obtained from Bake King at Haig Road. If you are interested to learn how to line the basket professionally using banana leaves, you can refer to my Group’s post : https://www.facebook.com/groups/Bloggerfoodies/permalink/763707907051879/ prepared by Ms. Kim Choo Ooi. I have purposely asked her to demonstrate to my members step by step pictures. As this is her property, I can’t posted in my blog. 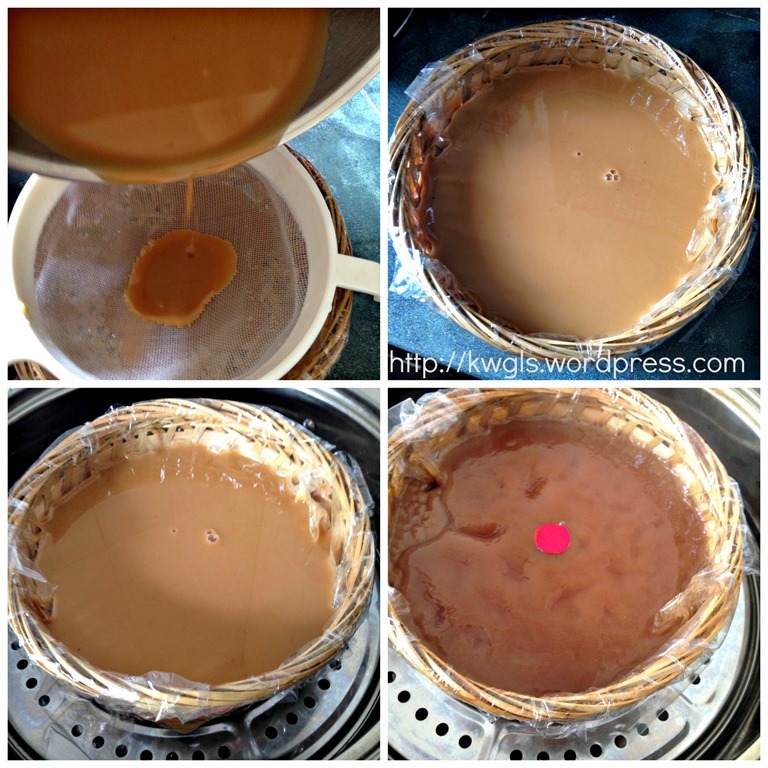 Put the white sugar and brown sugar in a sauce pan, heat under medium heat until all the sugar have melted. Add in the water carefully. Be careful as the water can splash out when added to the hot syrup. Let the syrup cool at room temperature. 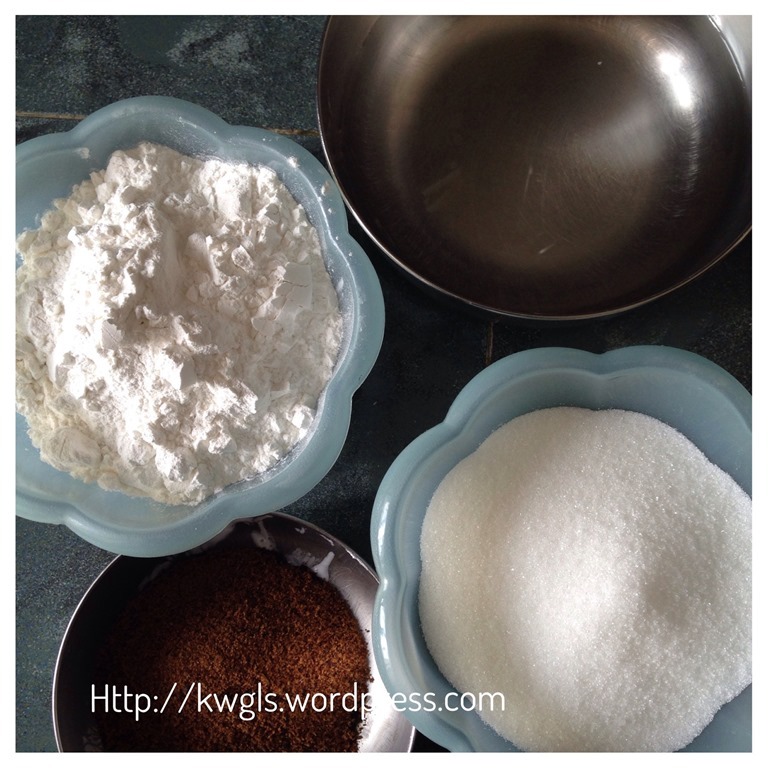 (Note that you can by pass this step and just mix sugar, water and flour together, see below). Put the syrup in a big mixing bowl, add glutinous rice flour, stir until as well combined as possible. Remember that the rice cake can be sticky when hot or even at room temperature. It will only harden in the room temperature for as long as in 1 week time. So don’t worry that it is not cooked. When hardened, cut into small pieces and fried in the same way of French Toast. 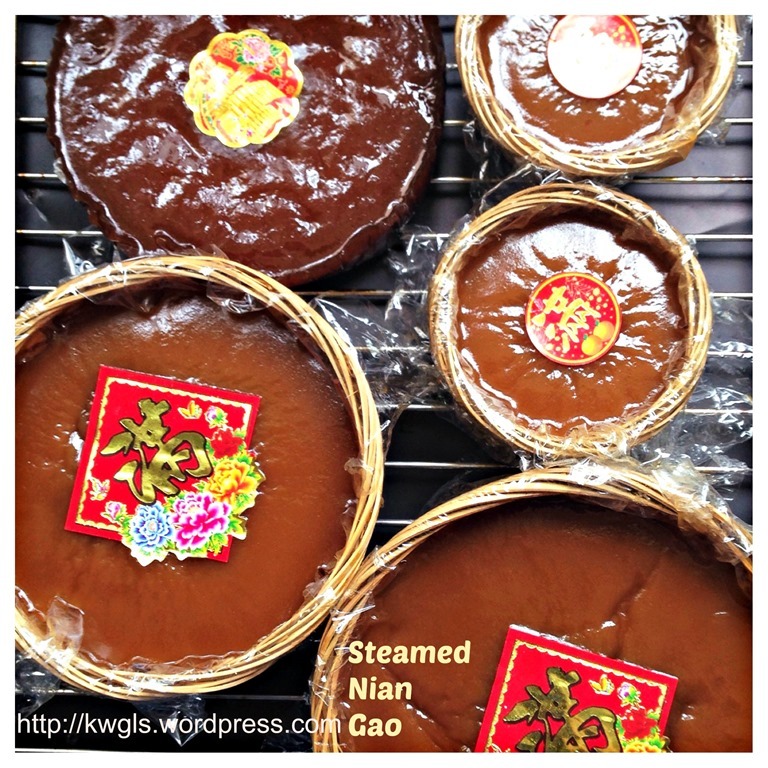 This year I have decided to steam Nian Gao for my neighbour and relatives. There is no changes in the ingredients except that I by pass the caramelization of sugar. 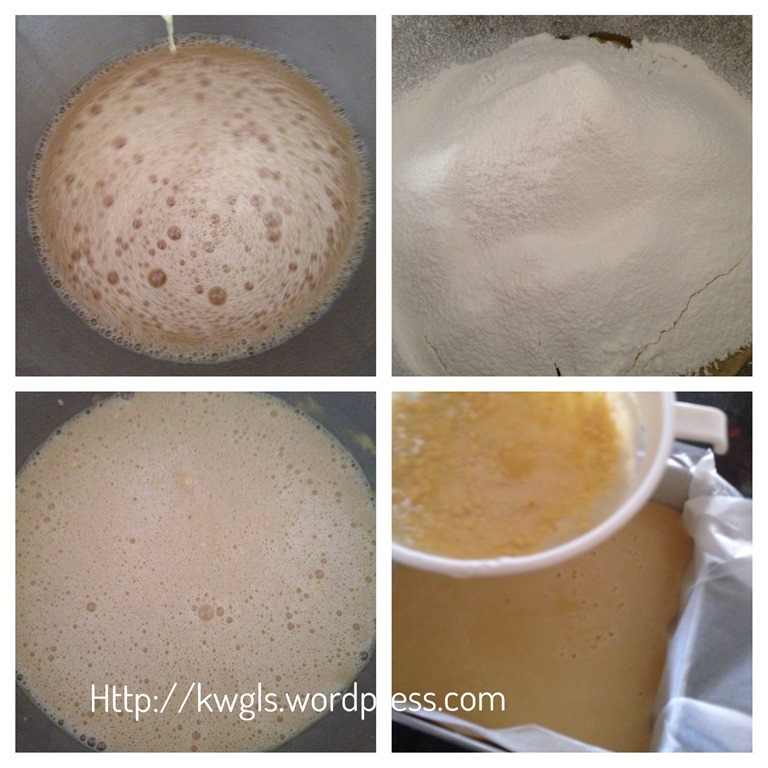 I mixed sugar, water and glutinous rice flour together,stirred until well combined, sift and steamed. This will save some time. 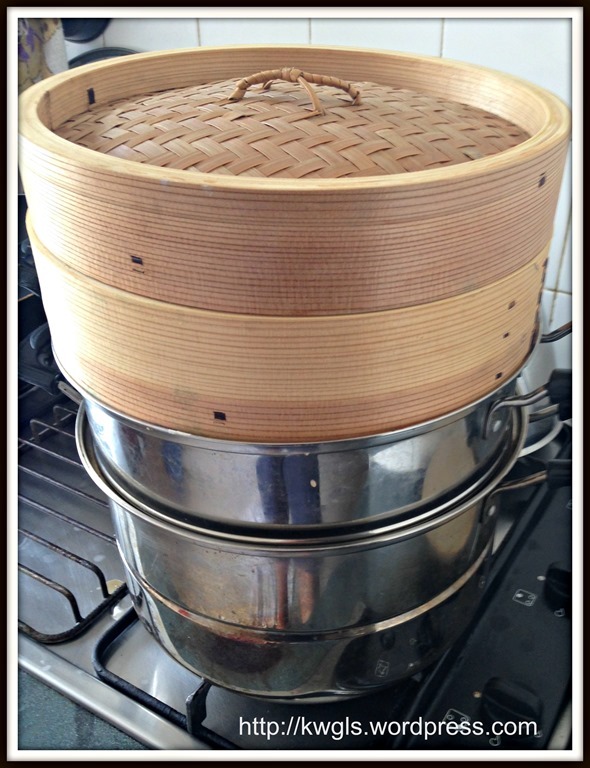 To further save the timing, I have fully utilized both my bamboo steamer and my aluminium steamer using 3 tiers. 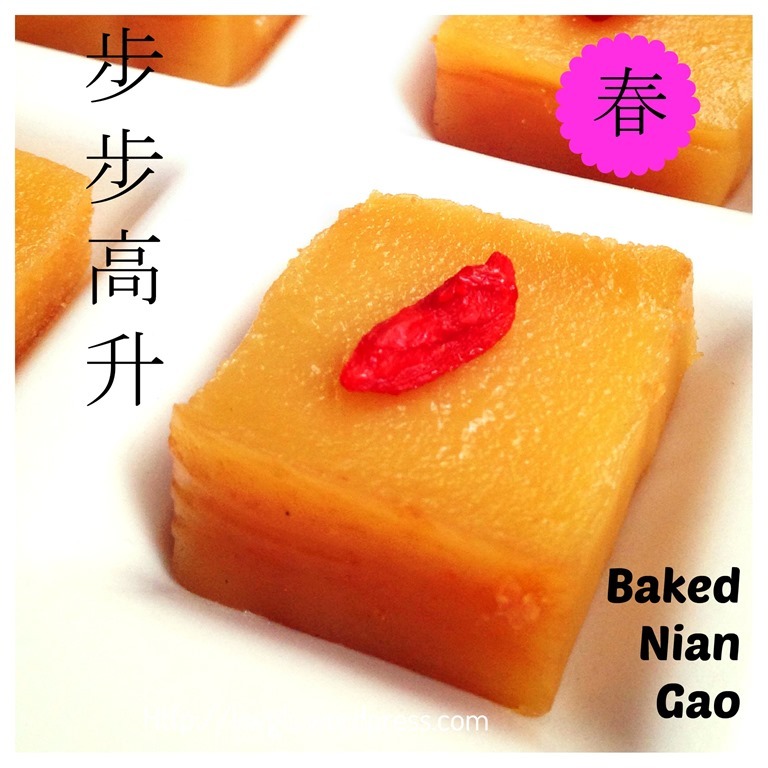 As a general rule, the large Nian Gao should be at the deepest layer and the smallest one should be on top as it is easier to cook. For this batch, I used about 1.5 hours from preparation to steam. As for the taste, it is quite similar but of course not as fragrant as the traditional method of steaming 10 hours to let castor sugar caramelize from white to brown. 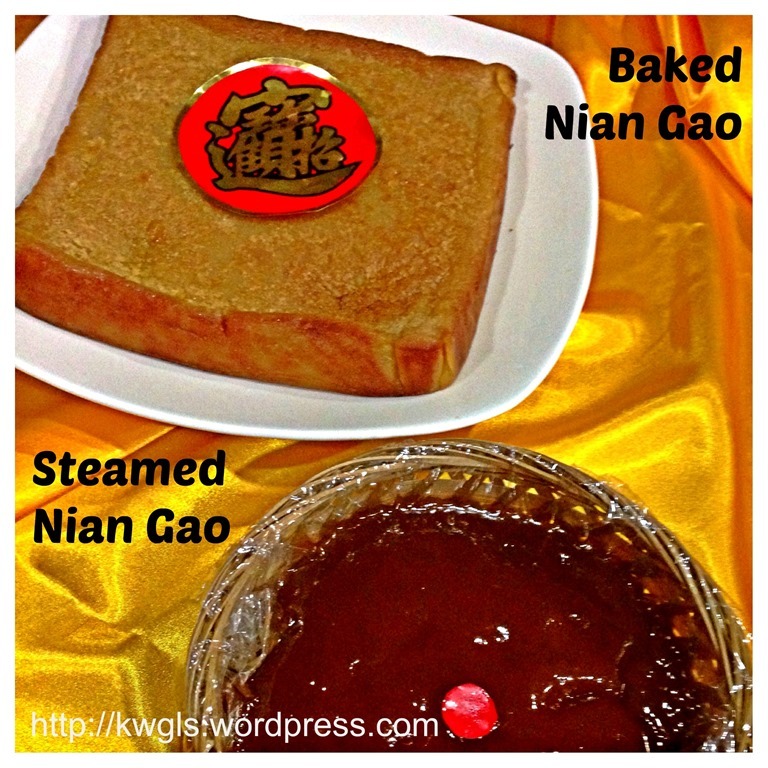 I can definitely take it as I know exactly what is in my Nian Gao as compared to the counter bought Nian Gao. Remember, as long as it is not watery, it is considered done. It will take weeks to get it harden. 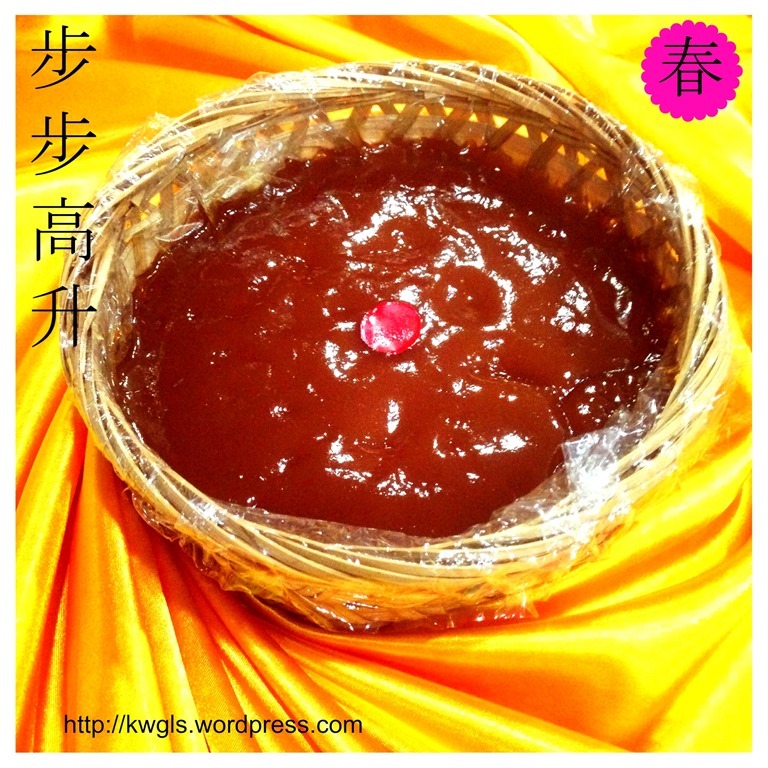 The one without basket is the Nian Gao of my earlier illustration and is just 90% hard after almost 2 weeks. 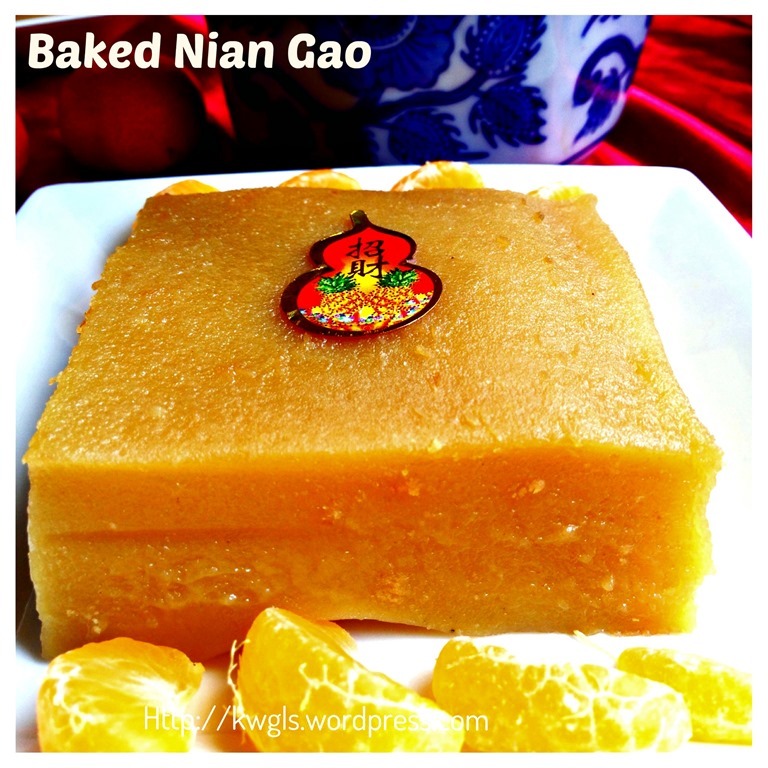 If you are afraid of mould grows on the Nian Gao, once it is slightly harden, lightly greased a layer of cooking oil on top of the Nian Gao. Baked or steamed, you decide. 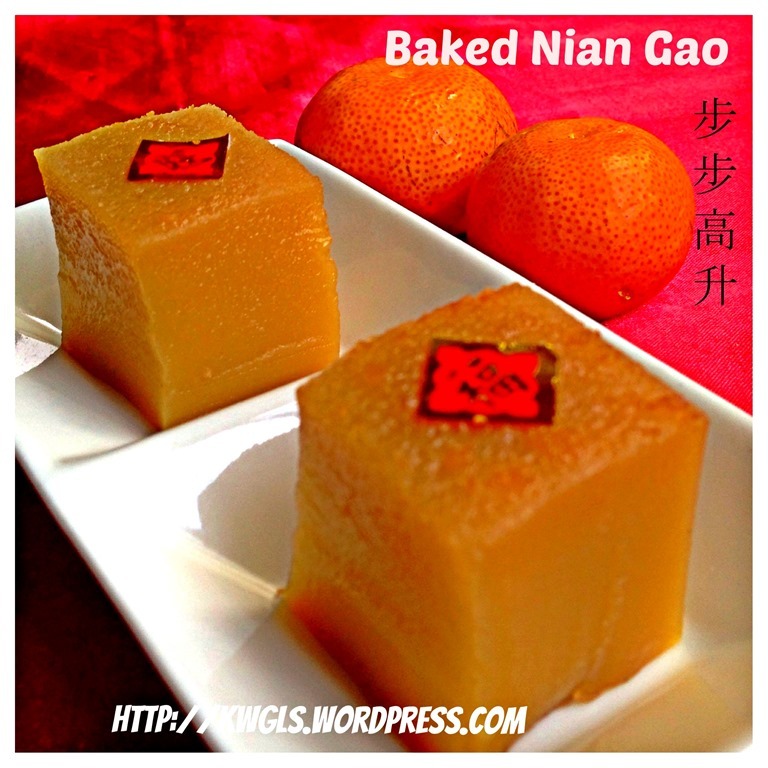 For me, I must have a Nian Gao in my house during Chinese New Year. I usually put it in my dining table until Chinese New Year is over. If you are concerned about the growing of moulds, just spread a layer of cooking oil on top of the hard surface. Even if the mould have grown without your notice, you will wash it with clean water, cut off the top surface and continue to cook the cake. Am I gross? Ha-ha. May be, but food is precious in olden days and this cake can only be eaten once a year. Do try the baked version. You wouldn’t regret it. 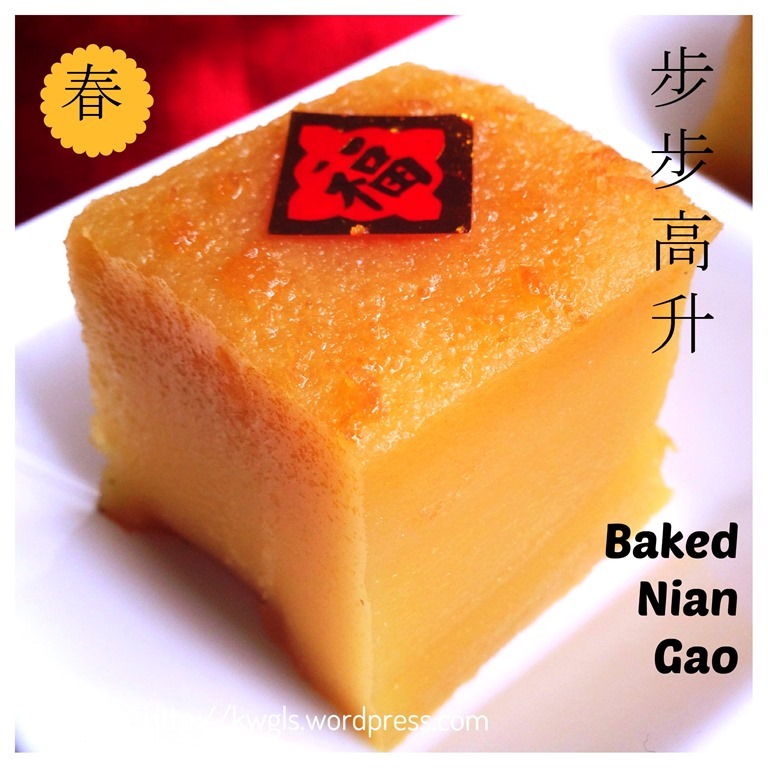 Neighbour who tasted the baked Nian Gao asked me what “kueh” – or local cake it is. It is full of coconut aroma and I can eat a quite a number of pieces after I started cutting the cake. Putting the deliciousness of the cake aside, do consume in moderation as glutinous rice is rather unfriendly to the gastro-intestinal system. 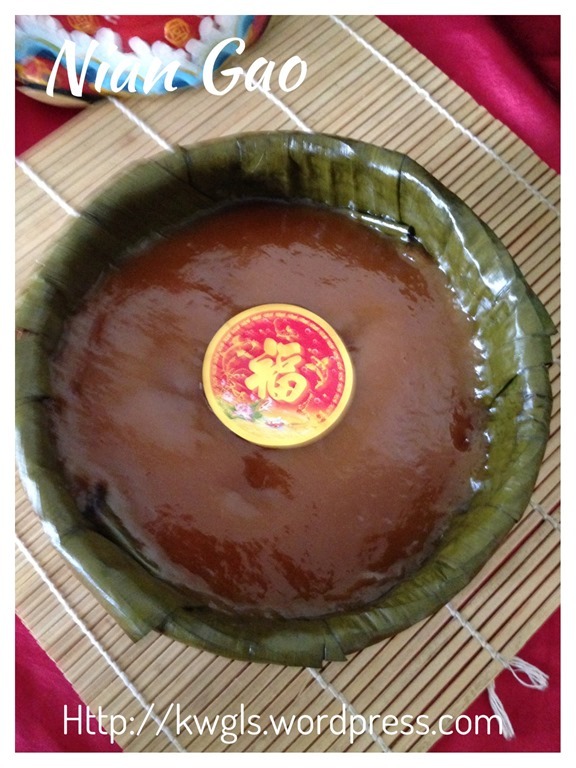 This entry was posted in Chinese and Asian Cakes and Snacks, Chinese New Year 2014, Food Preparation Series and tagged 8, baked glutinous rice cake, Chinese New Year 2014, glutinous rice cake, GUAI SHU SHU, Guaishushu, kenneth goh, nian gao, postaday, steamed glutinous rice cake, 年糕， 烤年糕，蒸年糕. Bookmark the permalink. how come you make everything seem so simple? I have never heard of this before. It definitely looks tasty. I would love to give it ago! Ken, can I change basket with baking pan ? May i know above 2 cups of glutinous rice flour , 2 cups of water and 1.5 cups of castor sugar equal to how many grams each? Sorry to bother u and you do the niao gao so beautiful, i love it. Thanks. To be frank, for this recipe, i never weigh as there is no reason to weigh it since all are standard measuring cup which an easy ratio to remember. Can I suggest that you just use your rice cooker measuring cup or in fact any cup to measure. As long as the ratio is correct (sugar:flour:water=1:1:1), that should be alright. Hey just found your site, you reminded me of my childhood days growing up in Kuching. Now I live abroad since 30 years, in Germany and just recently moved to the States. CNY just round the corner I will definitely try out your receipes. Great! Can I substitute brown sugar for castor sugar? New Year glutinous if i leave the eggs out. Is that possible. 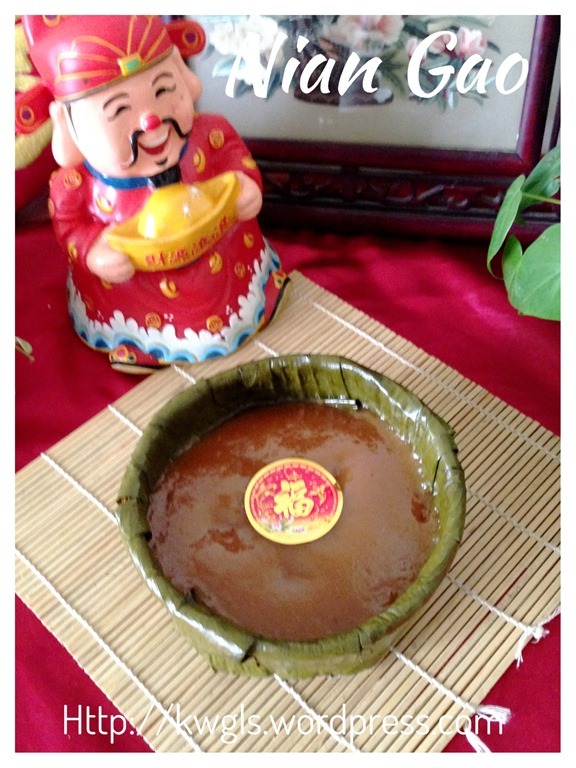 I am sorry I am not very sure as I have never try before..
Hi, May i know how to do that when the nian gao is cooked? Thanks a lot for your recipes!